When looking for the annual results of the Italian Activity Contest 2016 on 1296 MHz yesterday, I was really surprised, to be the winner. I haven´t expexted this, as Giorgio, IK3GHY, had a higher score in total all the time. But as he won in 2015, he was out of competition in 2016. I have to respect his success and congratulations for your extraordinary score, Giorgio! See the full 23 cm results here. But anyway, it was great fun to work the italian lads every 3rd Tuesday in month. Hopefully, there will be enough time to be QRV in the 2017 events. I am also looking forward to go to Italy in October, meeting friends in Venice and at the Alpe Adria meeting near Udine. Steve, IU1EAF, will be the contest manager in 2017 and the rules have changed too (english version online now). Thank you to Alfredo, IK2FTB, for all the work in the past year. 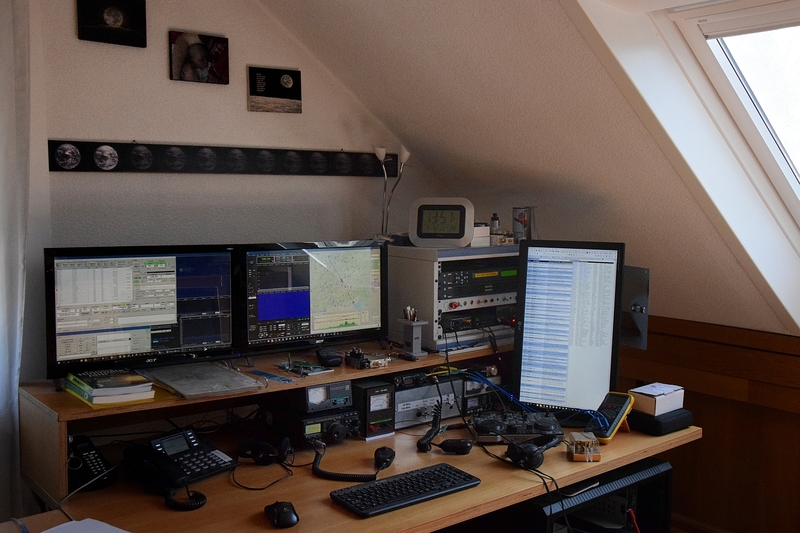 This entry was posted in Contest and tagged 1296 MHz, 23 cm, Aircraft scatter, Contest, DJ5AR, I.A.C., IAC, Italian Activity Contest on 2017-01-12 by admin. The yagis are full of ice and no more useable. The dish just grins about! This entry was posted in Equipment and tagged dish, DJ5AR, Mainz on 2016-12-08 by admin. 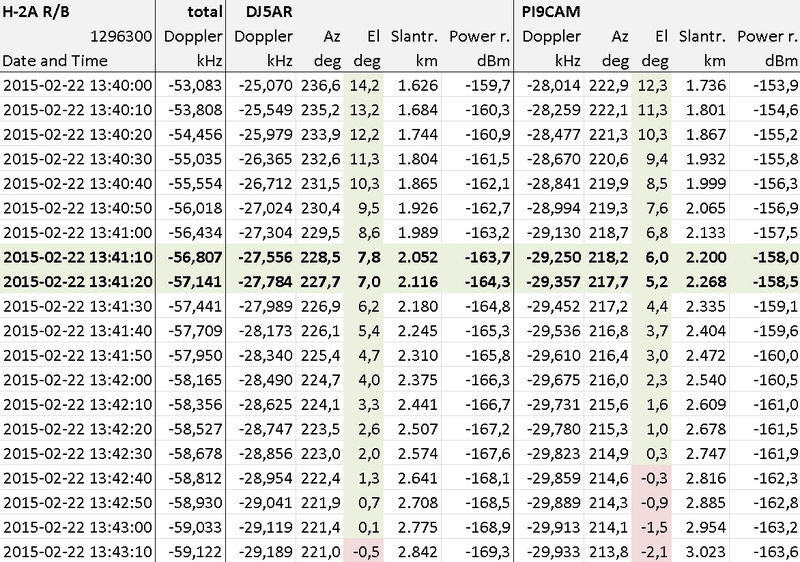 Since QSOs via ISS Bounce are quite easy to perform, Jan, PA3FXB, and I evaluated the possibilities, to use other objects in orbits around the Earth. The table below shows a selection of objects in earth orbits. 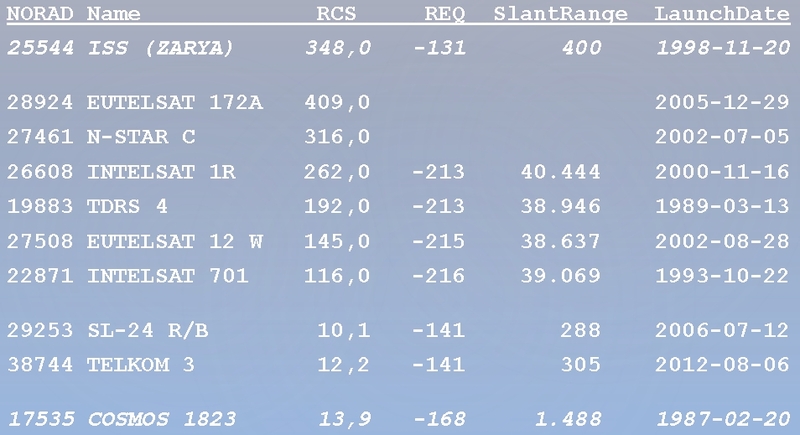 There are some quite big ones in geostationary orbits, but the distance is the most limiting factor, not the size, as can be seen in the predicted maximum reception level provided by the radar equation. So I had an intense survey on the objects in low orbits and determined the maximum linkbudgets, to filter the most promising ones. My PC had to work a couple of hours to perform that. On the end it has been a little surprise, that COSMOS 1823, an old soviet geodetic satellite, wasn´t among them. We used it for previous tests and were able to detect faint reflections. At our meeting on the Dorsten GHz Convention last Saturday, we discussed latest details. 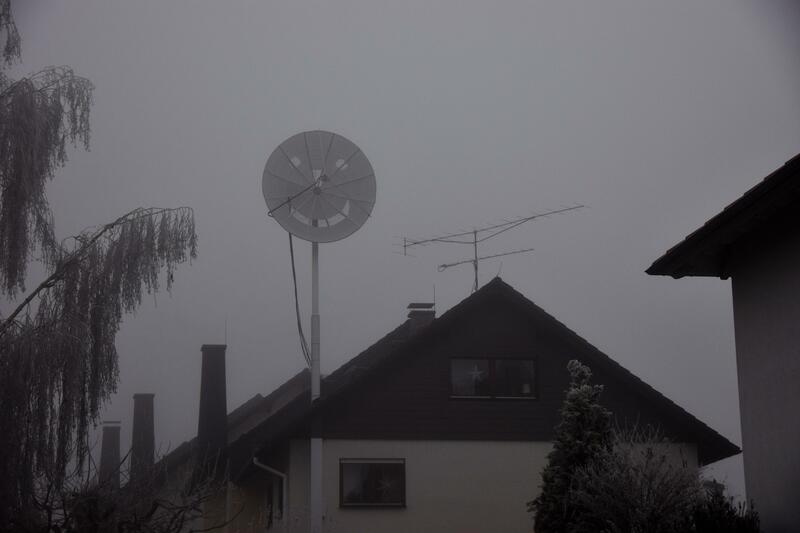 On Sunday, Jan and the crew of PI9CAM activated the Dwingeloo Telescope for the 23 cm EME SSB contest, but they had some spare time for other experiments. Just to warm up we had a nice SSB QSO via the moon first, right after their first QSO PA/JW: Congratulations! Some of the top objects would pass on suitable elevations and we decided to start with NORAD 39771 which is the second stage of a japanese H2A202 rocket, launched on May, 24th 2014 with a radar cross section of 20.7 m². 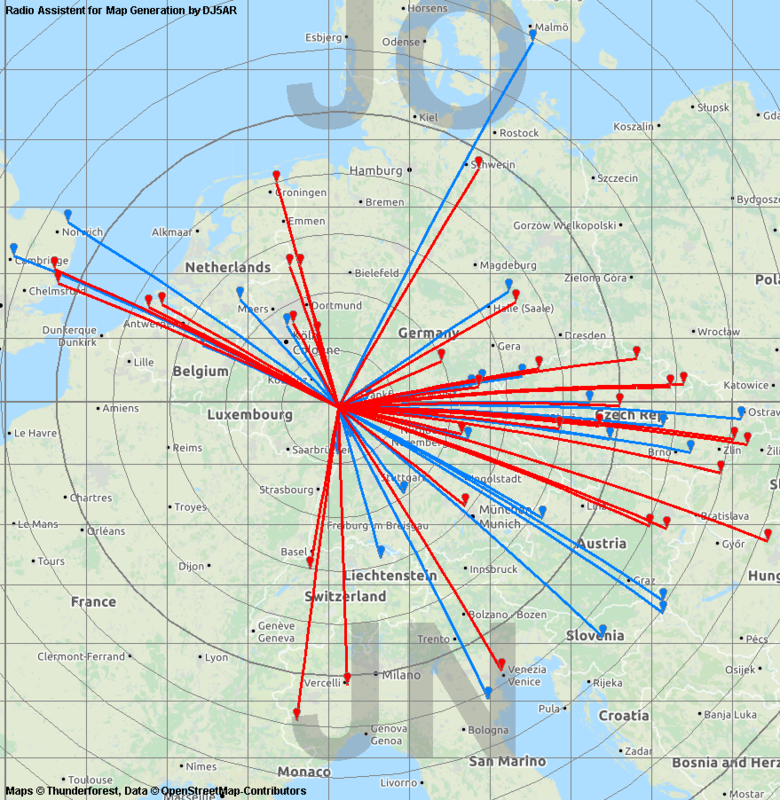 DJ5AR was to transmit CW continously, while PI9CAM checked for reflections. After some trouble with the tracking they caught it shortly before set. 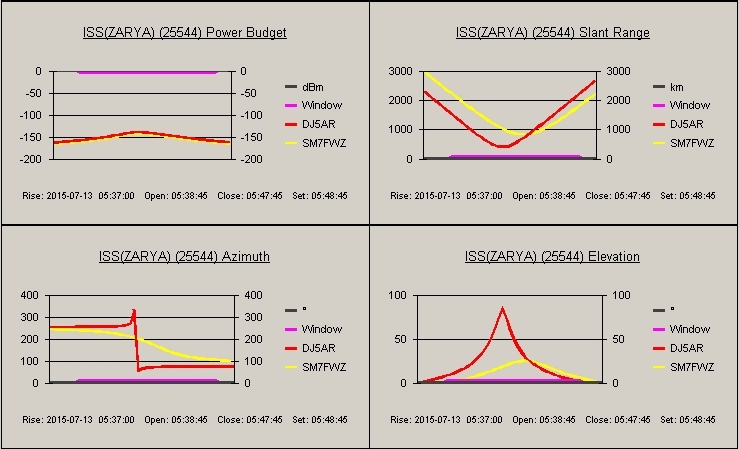 The used power at DJ5AR was 150 W into a 3 m dish (28 dBi) and the PI9CAM team used their 25 m dish (48 dBi) for reception. The predicted signal level was about -158 dBm, but, as can be heard, it´s clearly audible. My signal could be picked up by PI9CAM when the rocket body rised up to 5 degrees over the horizon and they tracked it for about 4 minutes until I lost the object near the culmination point, when the angle velocity became too fast for my tracking system. 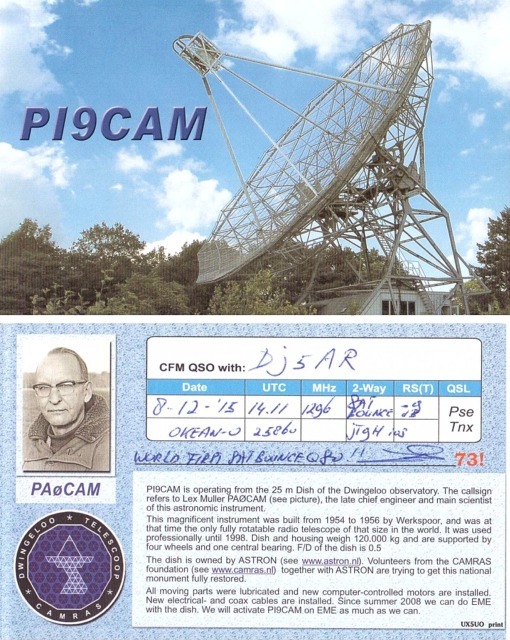 DJ5AR as received by PI9CAM. Picture is upside down for better matching to the table. The signal has been detected at an predicted signal level of -160 dBm and became clearly audible soon for serveral minutes. So we can think of trying a CW QSO next time. The drift, which can be seen, has it´s cause in my transmitter, running for the duration of the whole pass without any pause. I will try to reduce the growing spread of the signal by using shorter intervals in the doppler correction. This entry was posted in Satellite Bounce and tagged 1296 MHz, DJ5AR, Dwingeloo, PA3FXB, PI9CAM, Rocket Body, Satellite Bounce on 2015-02-22 by admin.